Whether in a Sailor's tale or a Faerie Tale, if you have heard a story about a ghostly stranger standing in the sea, or a face appearing beneath the water's depths, then you have heard witness of the Ashray. This Ashray is rising up from the ocean depths. He is wearing only a leather sash and a faux hoop earring (made of clay). He is hand painted with oil-based acrylics. 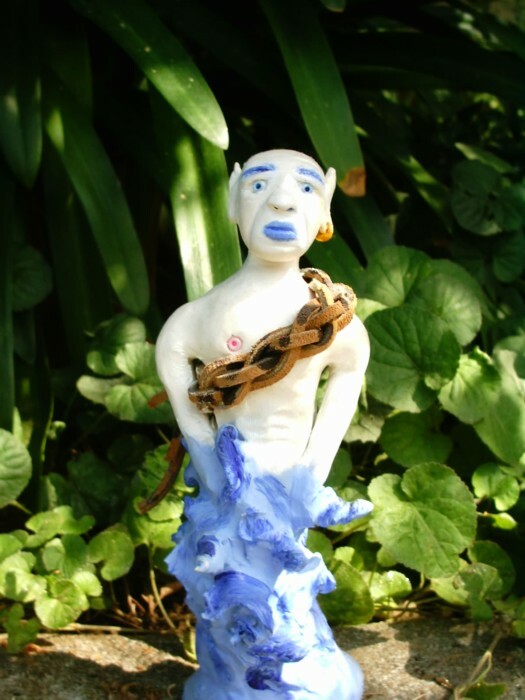 His eyes are made from beautiful blue beads molded into the sculpture. He is made of Polymer Clay and stands 7 inches tall.